The Department for Public Health (DPH), within the Cabinet for Health and Family Services, is reminding Kentuckians to get vaccinated against the flu. DPH officials report weekly influenza activity to the CDC as part of statewide flu surveillance efforts. The weekly report is located online at https://healthalerts.ky.gov/Pages/FluActivity.aspx will be updated by noon each Friday. Kentucky currently is reporting 28 laboratory-confirmed cases of flu and one influenza-related death. The state flu activity level is currently classified as “sporadic”. The report consists of laboratory-confirmed cases of influenza that are defined by molecular virus testing and positive virus culture test results. Rapid positive influenza tests are not included in this report, but are used as an indicator of flu-like illness circulating across the state. Adequate supplies of flu vaccine are expected to be available for this year’s flu season. Vaccination can be given any time during the flu season, but providers are encouraged to administer the vaccine as soon as possible. During the 2016-17 and 2017-18 influenza seasons, ACIP recommended that Flu Mist not be used because of concerns about low effectiveness against influenza A (H1N1). However, ACIP recommends that FluMist once again be an option for vaccination during the 2018-2019 influenza season for persons for whom it is age-appropriate and who have no medical contraindications. The change in recommendation is a result of the influenza A (H1N1) strain being changed in the current FluMist formulation. Due to the timing of the decision by the ACIP regarding use of FluMist, the Kentucky Vaccines for Children Program (VFC) will not be offering FluMist for VFC or KCHIP patients during the 2018-2019 influenza season. However, some private providers will offer FluMist this season for their patients. The flu vaccine is especially important in light of the severe season experienced last year across the U.S. 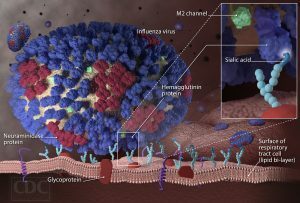 The CDC reports that more than 900,000 flu-related hospitalizations occurred and more than 80,000 people died as a result of flu. In Kentucky there were 333 flu-related deaths, 5 of which were pediatric. Of the pediatric flu deaths reported in last year’s season, more than one-third of these occurred among healthy children between the ages of 6 months and 4 years. It is especially important for pregnant women to be vaccinated before or during pregnancy. Antibodies cross the placenta and provide immunity to infants up to 6 months of age, when the infant is eligible to receive their dose of flu vaccine. The Kentucky Department for Public Health (DPH) has received reports of two laboratory-confirmed influenza cases, indicating the presence of flu activity in Kentucky. The cases were from Jefferson County. Beginning in October, DPH officials will begin to report weekly influenza activity to the Centers for Disease Control and Prevention (CDC) as part of statewide flu surveillance efforts. Adequate supplies of flu vaccine are expected to be available for this year’s season. This season, only injectable influenza vaccine formulations will be distributed in the United States. Vaccination can be given any time during the flu season. Adequate supplies of flu vaccine are available for this year’s season. Vaccinations can be given any time during the flu season. The flu activity level is tracked weekly as part of the CDC national flu surveillance system. “You should also follow the advice your parents gave you to prevent flu and other illnesses that tend to circulate at this time of year – wash your hands frequently, cover your mouth when you cough or sneeze and stay home when you’re sick,” concluded CHFS Secretary Vickie Yates Brown Gilsson. Infection with the flu virus can cause fever, headache, cough, sore throat, runny nose, sneezing and body aches. Flu can be very contagious. For more information on influenza or the availability of flu vaccine, please contact your local health department or visit http://healthalerts.ky.gov. Flu activity in Louisville has increased sharply over the past two weeks, and health officials are urging people to get immunized. In the last week of December, there were 10 laboratory-confirmed cases, and already this week there have been another 10 confirmed cases. These 20 laboratory-confirmed cases in Louisville in less than two weeks compare to only eight for the preceding seven weeks. Every year there are far many more flu cases than those tested for or reported. Flu shots are available at physicians’ offices and pharmacies, such as Walgreen’s Rite Aid and CVS, and at many grocery stores. The cost of flu shots is covered by most insurance plans, by Medicare and by Medicaid. To find the nearest flu shot provider, visit https://www.cdc.gov/flu/consumer/index.html and enter your Zip Code in the Flu Vaccine Finder. The CDC estimates that 3,000 to 49,000 people in the United States die each year from flu and related complications. The CDC also estimates that approximately 310,000 people across the country were hospitalized with the flu last flu season.